Winter plans to make up for lost time tonight as a major late-season snowstorm promises to deliver one to two feet of snow to just about the entire northeastern United States. The nor’easter will snarl travel for several days during and after the storm, bringing life to a grinding halt until crews can sweep away the frozen reprieve from spring. If current forecasts hold true, some of the heaviest snow could fall around the New York City area, potentially making this one of the biggest winter storms in the city’s history. A sprawling nor’easter will develop on Monday night and continue through the day on Tuesday, leaving behind formidable amounts of snow from the Appalachian Mountains of North Carolina to the Canadian Maritimes. Precipitation will begin around the Washington D.C. area on Monday night, spreading north through the nighttime hours. The storm will encounter enough cold air that the majority of the precipitation will fall as snow, but ice and rain will mix close to the coast. This presents a major issue for forecasters, as a small change in the track of the storm could have huge implications for tens of millions of people. Current forecasts from the National Weather Service call for widespread accumulations of a foot or more covering just about everyone from Maryland to Maine, with totals approaching 2 feet in northeastern Pennsylvania and the southern Hudson River Valley. On Monday afternoon, the forecast called for an even 20 inches of snow in New York City proper, with similar amounts to the city’s north and west. Snowfall amounts to New York City’s north and south—including Boston, Massachusetts, and Philadelphia, Pennsylvania—could wind up around a foot, give or take a few inches. The storm will begin with ice and rain farther down Interstate 95 toward Baltimore, Maryland, and Washington, D.C., which are both on track to see about 4 to 8 inches of snow if everything unfolds as currently forecast. The amount of land expecting heavy snow from this nor’easter is unusual—areas as far west as Buffalo, New York, are expecting a foot or more of snow—largely because a low-pressure system over the Great Lakes will move east tonight and merge with this nor’easter on Tuesday, providing it the extra moisture and lift it needs to grow its reach much farther inland than you would expect from a typical East Coast snowstorm. As with every nor’easter, the huge caveat with snowfall totals is the exact track the storm takes as it moves along the coast. Winter storms that move up the East Coast are a tricky balancing act between warm and cold air at the surface and mid-levels of the atmosphere. Subtle changes in temperature can mean the difference between a memorable snowstorm and a sloppy, icy mess that’s more dangerous than photogenic. If the nor’easter tracks closer to the coast than current forecasts expect, communities that lie along Interstate 95 could see dramatically lower snowfall totals than anticipated. On the other hand, if the storm tracks 10 or 20 miles farther out to sea than expected, the heaviest snow will follow this eastward movement and deliver an even greater blow to the major cities that make up the megalopolis. If you live in the affected areas, the snowfall totals in your current forecast are what’s most likely based on present information available to meteorologists. You could see less or more depending on the exact track of the storm, which is very hard to know until the storm is already underway. Regardless of the exact amounts, this will be a far-reaching and highly disruptive snowstorm. Flight and rail cancellations are a given. Highways will likely be slowed to a crawl during and after the snow, while local roads could remain impassable to most vehicles for at least a day or two. Many school districts will likely close for the remainder of the week, even in areas that are usually resilient during winter weather. Moreover, the psychological and societal impact of this storm will be greater than usual because of how abnormally warm it’s been this winter. On top of the hardship caused by one to two feet of snow, the snow will be accompanied by strong winds that could damage trees and power lines. Blizzard warnings are in effect for coastal counties between Atlantic City, New Jersey, and the border between Connecticut and Rhode Island, including the entire New York City metropolitan area and western half of Long Island. Sustained winds of 30 to 40 mph are likely across areas expecting blizzard conditions, with gusts of 50 to 60 mph possible. So what is a blizzard, exactly? A blizzard occurs when sustained winds of 35 mph or stronger create blowing snow that reduces visibility to one-quarter of a mile or less for three consecutive hours. It’s a pretty technical definition that’s hard to meet, but the weather conditions required for a “true blizzard” equate to a disorienting whiteout. Venturing even a few dozen feet from safety during a whiteout can put you at great risk for becoming disoriented and possibly lost, a risk that’s even greater when the heaviest snow and wind occurs at night. As tempting as it is to play in the snow, stay inside during blizzard conditions if you can help it. This could be one of the most significant winter storms to ever hit the northeastern United States during the month of March, and in some spots it could rank in the top-10 all-time winter storms. 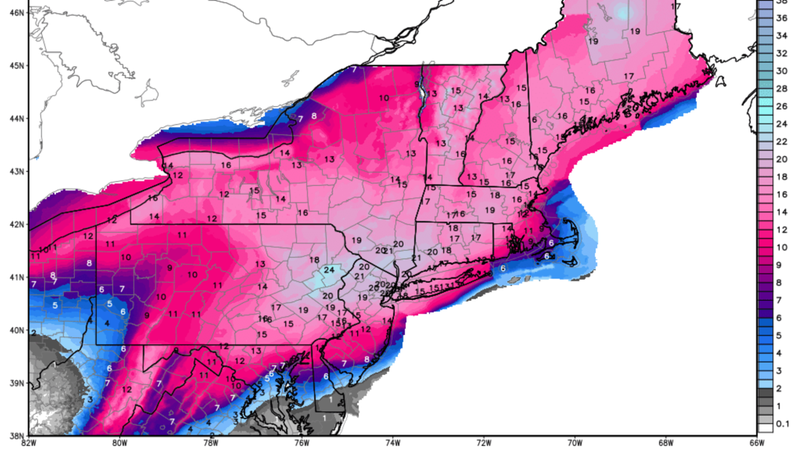 If the current NWS forecast of 20 inches of snow comes to pass at the weather observing station in New York City’s Central Park, for instance, it would be the fourth-largest one-day snowfall in the station’s 127-year history, and it could place as number 9 or 10 in the list of top-10 snowstorms. The storm probably won’t break any all-time records in other major cities, but it could easily become one of the largest March snowstorms on record all along the Interstate 95 corridor.